Cosplay is a part of our culture nowadays, and it is not just for young people. To prove that, I am going to write about our very famous ‘Sailor uniform oji-san’ of Japan today! He appeared around Tokyo area in girls’ sailor uniform typically worn by junior high/ high school students in Japan with braided long beard. He became very popular through Twitter, and people started to think that seeing him in girls’ sailor uniform is a sign of luck. You may wonder what was the actual trigger for him to start dressing like this, but it seems it was very simple and easy; there was a ramen shop which gives you a bowl of ramen for free of charge if you come in with girls’ sailor uniform on. That was the first day he went outside with the uniform. Also, girls’ sailor uniform is an icon of cuteness, and he simply wondered if it will still be taken as a sign of cuteness when he wears it. Sounds very healthy and experimental, doesn’t it?? 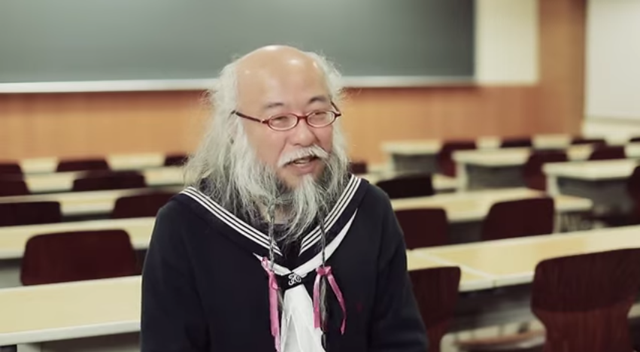 FYI, he is not in girls’ sailor uniform full-time; it seems he works full-time as an engineer, speaks very fluent English, and only wears the dress when he’s off work. He also takes pictures of cosplayers, too. He is due to provide special seminar in a well-known clam school of Japan about rich and happy life in July.